Fort Benning is a United States Army post straddling the Alabama–Georgia border next to Columbus, Georgia. Fort Benning supports more than 120,000 active-duty military, family members, reserve component soldiers, retirees, and civilian employees on a daily basis. It is a power projection platform, and possesses the capability to deploy combat-ready forces by air, rail, and highway. Fort Benning is the home of the United States Army Maneuver Center of Excellence, the United States Army Armor School, United States Army Infantry School, the Western Hemisphere Institute for Security Cooperation (formerly known as the School of the Americas), elements of the 75th Ranger Regiment (United States), 3rd Brigade – 3rd Infantry Division, and many other additional tenant units. The Chattahoochee River runs through Fort Benning. It is named after Henry L. Benning, a brigadier general in the Confederate States Army during the Civil War. Since 1909, Fort Benning has served as the Home of the Infantry. Since 2005, Fort Benning has been transformed into the Maneuver Center of Excellence, as a result of the 2005 Base Realignment and Closure (BRAC) Commission's decision to consolidate a number of schools and installations to create various "centers of excellence". Included in this transformation was the move of the Armor School from Fort Knox to Fort Benning. Fort Benning is named after Confederate General Henry L. Benning. Camp Benning was established in October 1909, after President Woodrow Wilson called for a special session of Congress, culminating Congressional work in the creation of the Revenue Act of 1913, reintroducing an income tax which lowered tariffs, (tariffs-a schedule of rates or charges of a business or a public utility) assigning permanent status in 1909. Initially providing basic training for World War I units, post-war Dwight D. Eisenhower served at Benning from December 24, 1918, until March 15, 1919, with about 250 of his Camp Colt, Pennsylvania, tankers who transferred to Benning after the armistice. :72 On December 26, 1918, a portion of the Camp Polk (near Raleigh, North Carolina) tank school was transferred to Camp Benning "to work in conjunction with the Infantry school". Camp Benning tank troops were moved to Camp Meade from February 19–21, 1919. In February 1920, Congress voted to declare Camp Benning a permanent military post and appropriated more than $1 million of additional building funds for the Infantry School of Arms, which later became the Infantry School. By the fall of 1920, more than 350 officers, 7,000 troops and 650 student officers lived at Camp Benning. The post was renamed to Fort Benning in 1922, after Henry L. Benning, a general in the army of the Confederate States of America. In 1924, Brig. Gen. Briant H. Wells became the fourth commandant of the Infantry School and established the Wells Plan for permanent construction on the installation, emphasizing the importance of the outdoor environment and recreation opportunities for military personnel. During Wells' tenure, the post developed recreational facilities such as Doughboy Stadium, Gowdy Field, the post theater and Russ swimming pool. Doughboy Stadium was erected as a memorial by soldiers to their fallen comrades of World War I. One of the Doughboys' original coaches was a young captain named Dwight D. Eisenhower. Lt. Col George C. Marshall was appointed assistant commandant of the post in 1927 and initiated major changes. Marshall, who later became the Army Chief of Staff during World War II, was appalled by the high casualties of World War I caused, he thought, by insufficient training. He was determined to prevent a lack of preparation from costing more lives in future conflicts. He and his subordinates revamped the education system at Fort Benning. The changes he fostered are still known as the Benning Revolution. Later in his life, Marshall went on to author the Marshall Plan for reviving postwar Europe and was awarded the Nobel Peace Prize in 1953. Crew of 37mm. anti-tank gun, in training at Fort Benning, Georgia. During World War II Fort Benning had 197,159 acres (797.87 km²) with billeting space for 3,970 officers and 94,873 enlisted persons. Among many other units, Fort Benning was the home of the 555th Parachute Infantry Battalion, their training began in December 1943 and was an important milestone for black Americans, as was explored in the first narrative history of the installation, Home of the Infantry. The battalion, later expanded to become the 555th Parachute Infantry Battalion, was trained at Fort Benning but did not deploy overseas and never saw combat during World War II. During this period, the specialized duties of the Triple Nickel were primarily in a firefighting role, with over one thousand parachute jumps as smoke jumpers. The 555th was deployed to the Pacific Northwest of the United States in response to the concern that forest fires were being set by the Japanese military using long-range incendiary balloons. The 82nd Armored Reconnaissance Battalion was activated July 15, 1940, and trained at the Fort. The 17th Armored Engineer Battalion became active and started training July 15, 1940. The 4th Infantry Division, first of four divisions committed by the United States to the North Atlantic Treaty Organization, reorganized and completed its basic training at Fort Benning (Sand Hill and Harmony Church areas) from October 1950 to May 1951, when it deployed to Germany for five years. The Airborne School on Main Post has three 249-foot (76 m) drop towers called "Free Towers." They are used to train paratroopers. The towers were modeled after the parachute towers at the 1939 World's Fair in New York. Only three towers stand today; the fourth tower was toppled by a tornado on March 14, 1954. During the spring of 1962 General Herbert B. Powell, Commanding General, U.S. Continental Army Command, directed that all instruction at the Infantry School after July 1 reflect Reorganization Objective Army Division structures. Therefore, the Infantry School asked for permission to reorganize the 1st Infantry Brigade under a ROAD structure. Instead, the Army Staff decided to inactivate the Pentomic-structured brigade and replace it with a new ROAD unit, the 197th Infantry Brigade, which resolved a unit designation issue. With the designation 1st Infantry Brigade slated to return to the 1st Infantry Division when it converted to ROAD, the existing unit at Fort Benning required a new title. The staff selected an infantry brigade number that had been associated with an Organized Reserve division that was no longer in the force. For the new ROAD brigade at Fort Benning, Georgia, the adjutant general on August 1, 1962, restored elements of the 99th Reconnaissance Troop, which thirty years earlier had been organized by consolidating infantry brigade headquarters and headquarters companies of the 99th Infantry Division, as Headquarters and Headquarters Companies, 197th and 198th Infantry Brigades. Chief of Staff of the United States Army George W. Casey Jr. at Fort Benning in 2009. Fort Benning was the site of the Scout dog school of the United States during the Vietnam War, where the dogs trained to detect ambushes in enemy terrain got their initial training, before being transferred to Vietnam for further advanced courses. Fort Benning also had an urban village, McKenna Military Operations in Urban Terrain, built by Army engineers for urban training of soldiers. It was used for live, virtual and constructive experimentation on soldier systems, weapons, and equipment. The site was approximately 200 meters square, and included 15 buildings resembling a European village. There was a church, small houses, domestic residences and office-style buildings. In 1984, following the signing of the Panama Canal Treaty, the School of the Americas relocated from Fort Gulick (Panama) to Fort Benning. After criticism concerning human rights violations committed by a number of graduates in Latin America, the school was renamed Western Hemisphere Institute for Security Cooperation. There are four main cantonment areas on Fort Benning: Main Post, Kelley Hill, Sand Hill, and Harmony Church. Main Post houses various garrison and smaller FORSCOM units of Fort Benning such as 14th Combat Support Hospital and 11th Engineer Battalion FORSCOM as well as a number of TRADOC-related tenants, e.g. the Officer Candidate School, the Non-Commissioned Officers Academy, and the Airborne School. McGinnis-Wickham Hall (formerly known as Infantry Hall) is the post headquarters and Maneuver Center of Excellence. Adjacent is a monument, the Ranger Memorial. Kelley Hill formerly housed the 3rd Armored Brigade Combat Team of the 3rd Infantry Division (Mechanized), the parent unit of two combined armed battalions; 1st Battalion, 15th Infantry Regiment, 2d Battalion, 69th Armor Regiment, as well as 3d Squadron, 1st Cavalry Regiment, 1st Battalion, 10th Field Artillery Regiment, and two support battalions; 3-3 BSTB, and 203d BSB. Between December 11, 2015, and December 15, 2015, the 3rd BCT's six subordinate battalions performed inactivation ceremonies on Sledgehammer Field. On December 16, 2015, 1st Battalion, 28th Infantry Regiment Task Force (or Task Force 1-28) was activated in its place. Task Force 1-28 is a 1053-member unit "made up of selected soldiers from the six inactivated battalions that formed the 3rd Brigade Combat Team, 3rd Infantry Division". Sand Hill is the primary location of the 198th Infantry Brigade, responsible for training Infantry One Station Unit Training (OSUT), and the location of the 30th AG Reception Battalion at Fort Benning. Home of 1-19 Infantry Battalion 2-19 Infantry Battalion, 1-50 Infantry Battalion, 1-46 Infantry Battalion, 2-47 Infantry Battalion, 3-47 Infantry Battalion 2-58 Infantry Battalion, and 2-54 Infantry Battalion. Harmony Church area houses the 194th Armor Brigade, 316th Cavalry Brigade Armor School and the first phase of Ranger School, 4th Ranger Training Battalion (ARTB). After the 2005 Base Realignment and Closure (BRAC) Commission's decision to create the Maneuver Center of Excellence (MCoE), Harmony Church is now the new home of the Armor School. 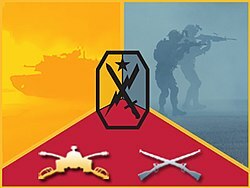 Chief of Staff, U.S. Army MCoE: Colonel Andrew Cole Jr.
Fort Benning was selected by the Base Realignment and Closing Commission to be the home of the new Maneuver Center of Excellence (MCoE). This realignment co-located the United States Army Armor Center and School, formerly located at Fort Knox, Kentucky, with the Infantry Center and School. This transformation was completed September 2011. ^ a b Rhea, Gordon (January 25, 2011). "Why Non-Slaveholding Southerners Fought". Civil War Trust. Civil War Trust. Archived from the original on March 21, 2011. Retrieved March 21, 2011. ^ Benning, Henry L. (February 18, 1861). "Speech of Henry Benning to the Virginia Convention". Proceedings of the Virginia State Convention of 1861. pp. 62–75. Retrieved March 17, 2015. ^ "Maneuver Center of Excellence". ^ "Eisenhower General Information". ibiblio.org. ^ Perret, Geoffrey (June 2000). Eisenhower (Google Books). ISBN 9781580624312. Retrieved January 21, 2011. ^ a b Rockenbach, Samuel D (October 13, 1919). Report of the Director of the Tank Corps for the year ending June 30, 1919. Congressional serial set, Issue 7688 (Report). Retrieved January 17, 2011. ^ a b Kane, Sharyn (May 2003). Fort Benning: The Land and the People. p. 172. ^ Benning, Henry L. (July 1, 1849). "Letter from Henry Benning to Howell Cobb". Civil War Causes. Retrieved March 17, 2015. ^ Ninke, Joshua. "Doughboys to honor veterans at Doughboy Stadium". Retrieved September 3, 2013. ^ "Fort Benning Historic Trail". Doughboy Stadium. Retrieved September 3, 2013. ^ a b Kane, Sharyn (May 2003). Fort Benning: The Land and the People. pp. 173–174. ^ Bunn, Michael J. (Summer 2008). "Home of the Infantry: The History of Fort Benning". Georgia Historical Quarterly. 92 (2): 268–270. ISSN 0016-8297. ^ Stelpflug, Peggy A.; Richard Hyatt (2007). Home of the Infantry: The History of Fort Benning. Macon: Mercer University Press. pp. 300–67. ISBN 978-0-88146-087-2. ^ "After action report 82nd Armored Recon Battalion, 2nd Armored Division, June 44 thru May 45". cdmhost.com. ^ "World War II unit histories & officers". unithistories.com. ^ "History of the 2nd Armored Division - Hell On Wheels". www.militaryvetshop.com. ^ "cgsc.edu American Armored Divisions 1941–1945" (PDF). Archived from the original (PDF) on July 27, 2014. Retrieved July 22, 2014. ^ Rubinstein, Wain (June 1969). "Enemy's Worst Enemy..." Danger Forward. Archived from the original on August 3, 2009. Retrieved June 17, 2009. ^ MetaVR. "MetaVR Virtual Fort Benning, McKenna Urban Operations Training Site". www.metavr.com. Retrieved August 28, 2018. ^ McCoy, Katherine E. (2005). "Trained to Torture? The Human Rights Effects of Military Training at the School of the Americas". Latin American Perspectives. 32 (6): 47–64. doi:10.1177/0094582x05281113. ^ Bill Wallace; Jim Houston (July 13, 2002). "Bay Area protesters sentenced in Georgia". San Francisco Chronicle. Retrieved August 12, 2012. ^ Wright, Ben (December 15, 2015). "1st Battalion, 28th Infantry Regiment Task Force activated". Columbus Ledger-Enquirer. Retrieved February 3, 2017. ^ "Major General Gary M. Brito". www.benning.army.mil. ^ "Command Sergeant Major Scott A. Brzak". www.benning.army.mil. ^ "Mr. Donald M. Sando". www.benning.army.mil. ^ "BRIGADIER GENERAL JAMES E. RAINEY : COMMANDANT, UNITED STATES ARMY INFANTRY SCHOOL" (PDF). www.benning.army.mil. ^ "Command Sergeant Major Martin S. Celestine". www.benning.army.mil. ^ "Brigadier General David A. Lesperance". www.benning.army.mil. ^ "Command Sergeant Major Kevin J. Muhlenbeck". www.benning.army.mil. ^ "Brigadier General Rafael A. Ribas". www.benning.army.mil. ^ "Colonel Andrew Cole Jr". www.benning.army.mil. ^ "Colonel Clinton W. Cox". www.benning.army.mil. ^ "CSM Connie L Rounds". www.benning.army.mil. ^ "Pathfinder". Archived from the original on October 17, 2012. ^ Maureen Rose (June 13, 2011). "Final units depart Fort Knox Armor School". army.mil. ^ Vince Little, The Bayonet (October 22, 2009). "Activation ceremony formally links Infantry, Armor under new command at Fort Benning". army.mil. ^ "Fort Benning and the Valley – Home – Welcome to the Chattahoochee Valley" (PDF). fortbenningandthevalley.com.